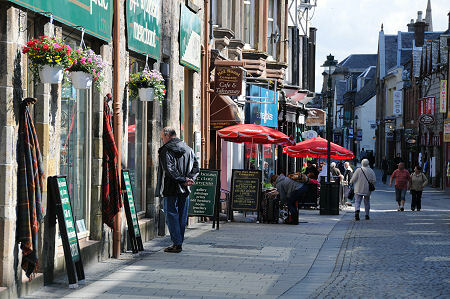 Fort William is the most important town in Scotland south of Inverness, west of Stirling, and north of Glasgow. It forms the natural centre of a very large area and the focus of the road and rail routes across the region. Most visitors to the Highlands are likely to find themselves here sooner or later. And that's no bad thing, for Fort William has a great deal to offer. It has to be acknowledged that the town is not universally admired by visitors' guides to Scotland. Concern tends to focus on the by-pass, the dual carriageway that largely cuts it off from the banks of Loch Linnhe. Critics overlook two things. First, that the road largely follows the path of the railway line opened in 1894 to serve a station then located further south and nearer the centre of the town. And second, what would improve things? To allow through traffic to go down the now pedestrianised High Street? To put in a by-pass on the hillside above the town? To build along the line of the old military road down Glen Nevis? 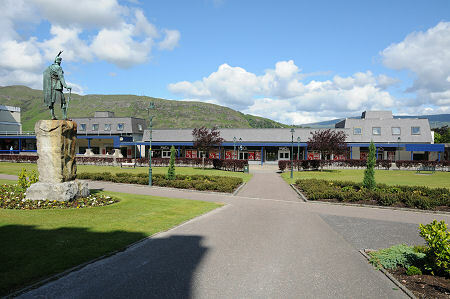 Turning to the positives, Fort William has everything you could possibly need while in the Highlands. The High Street has a reasonable range of shops, and outdoor enthusiasts are especially well catered for by large outlets at either end of the underpass leading to the railway station. Meanwhile the development area north west of the station houses a large supermarket and is essential visiting for anyone on a self-catering holiday. There are a wide range of eating and drinking opportunities in Fort William, ranging from good fish and chips, to rather more upmarket establishments, including the prize winning Crannog Seafood Restaurant. The town also marks the end of the West Highland Way, Scotland's oldest and most popular long distance walk: and the start of the Great Glen Way. The steady stream of footsore travellers coming into the town from Glen Nevis is a reminder of just how far the 96 miles from Milngavie, near Glasgow, can seem. Meanwhile a fresher stream is embarking on the 73 mile trek to Inverness. Following an extension, the West Highland Way now concludes at the south end of Fort William's main street, where you are greeted by the seated statue of a resting walker looking out towards Loch Linnhe. The start of the Great Glen Way can be found within the Old Fort, on the shore of Loch Linnhe near the railway station. There's plenty to do in Fort William when weather or inclination rule out a day in the hills. The West Highland Museum in the centre of the town is excellent, while St Andrew's Church, towards the north end of the main street, has a very attractive interior. Also well worth a look is St Mary's Catholic Church, on Belford Road, and no visit should be considered complete without a look at the Old Fort, almost invisible to passing traffic on the shore of Loch Linnhe close to the roundabout at the northern end of the dual carriageway bypassing the town centre. At the north end of Fort William, overlooking the roundabout at the junction with the A830 to Mallaig, is Ben Nevis Distillery. This is not Scotland's prettiest distillery, but it does have a lot to offer in the way of charm and a friendly welcome. A couple of miles miles west, at Corpach, you can admire Neptune's Staircase of locks on the Caledonian Canal. Also in Corpach is the wonderful collection of crystals, gemstones and fossils at Treasures of the Earth. Meanwhile, no description of Fort William could be complete without reference to Ben Nevis, normally climbed from Glen Nevis, just to the north east of the town. This is the UK's highest mountain. 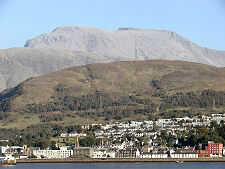 Though the Ben dominates the town in distant views, especially from across Loch Linnhe or from Corpach, it is invisible from most of Fort William itself due to the intervening ridge separating the town from Glen Nevis. Just a little further north east is the Nevis Range ski centre, with its gondolas taking you high onto Aonach Mor. There is a great deal of accommodation on offer in and around Fort William, ranging from self catering to guest houses, B&Bs, hostels and hotels. Inverlochy Castle Hotel, three miles to the north of the town describes itself as "Scotland's finest luxury hotel", a claim unlikely to be challenged by anyone who has had the pleasure of staying. A little closer to Fort William (and not to be confused with the hotel) is Inverlochy Castle, a ruined medieval fortress with a bloody history: and very well worth a visit in its own right.